Italy. The country of love. The birthplace of Romeo and Juliet. One of the most romantic places in the world. Where else would you want to spend a special Valentine’s Day this year? There is something so charming about Italy and it’s people. There’s an atmosphere and a way of life which transmits romance into every aspect of our lives. It is in our culture and the way that we think about things. People come here from all over the world to experience it as Italy is synonymous with romance, love, charm and passion. Arm in arm, or hand in hand, wondering through Rome together is surely one of the most romantic ways to spend Valentine’s Day. If you like the hustle and bustle of the city, the charm of Rome is second to none. Through the old streets, couples everywhere are captivated by the history, culture and romance. However, nothing quite compares with Rome at night. A city alight with the allure of romance and landmarks illuminated against the evening sky. The atmosphere is no less bustling, but there is a change as the evening comes. People are more relaxed and inclined to wonder the streets arm in arm, soaking up the ambience. Escape the main streets and journey off the beaten track to find a moment of solace in the hidden secrets of Rome. In this quiet, just take a moment to drink in the atmosphere and appreciate the day together, enjoying Valentine’s Day in one of the most romantic countries in the world. As you meander down the cobbled streets, discovering new and beautiful things together, you can share in the romantic walk, learning about the history and the culture from our guides. Experience the hidden Romance of Rome this Valentine’s Day. Outside of Rome, Verona is one of the most romantic places in Italy to visit this Valentine’s Day. It is the city of love. The city where a beautiful love story ended too soon, with two people paying the ultimate sacrifice. A sacrifice that could have been avoided. This is the tragic irony that leads thousands every year to this 'pilgrimage of love’ where Romeo and Juliet began their courtship. It’s not only couples who partake in this journey, but those with romantic tendencies and those who can immerse themselves in the beautiful story of two people so deeply in love. Is there a better way to spend Valentine’s Day? One of the most enticing places to visit is Juliet’s balcony. The scene where romance blossomed and two people fell deeply in love. Is it any surprise that people are so taken with the charm of it? Caught up in the romance, people write letters and notes declaring their love for their other half, as the legend says that a letter to Juliet will secure your love for all time. Others write for advice from the Juliet, which are actually answered by ‘Juliet’s Secretaries’ on her behalf. It doesn’t stop here. The customary tradition of touching Juliet’s right breast is said to bring you true love. Over the years, the hopeful touch of visitors has made Juliet’s statue famous and sacred to the love-seekers. So, follow the footsteps of Romeo and Juliet, and take part in the traditions of romance in Verona -the City of Love! You’ve read about it in books and seen it in films. A private Gondola ride through the heart of Venice is one of the most enchanting ways to experience the city. Lie back and let your Gondolieri to lead you through the canals and witness Venice from a whole new perspective. Here it is just about the two of you, removed from the crowds, enjoying the peaceful lap of the water around you. As you gaze up at the buildings surrounding you on either side, you can see some of the most sought after attractions in Venice, such as the Baroque Salute Church and La Fenice Opera House. 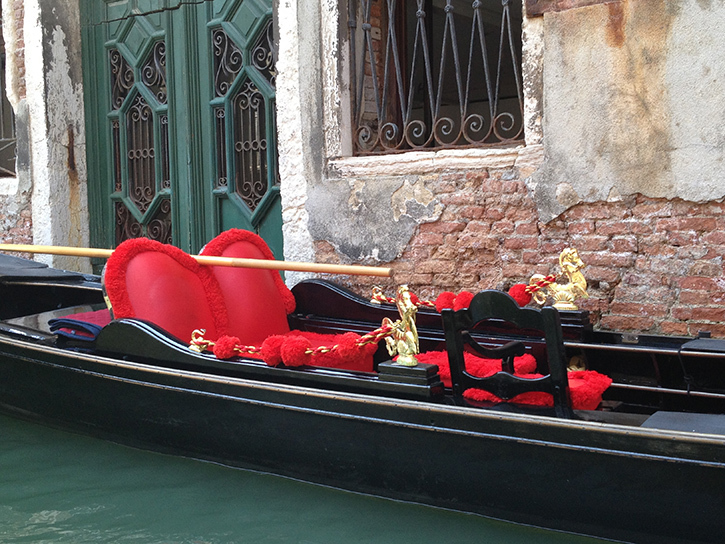 Let's enjoy this moment together on a private Gondola ride through Venice. Valentine’s Day in Italy is a truly wonderful time. We make it our business to know romance and to seduce you with the charm of our cities. We look forward to welcoming you this Valentine’s Day, let the romance begin.